WBBME Alim, Fazil, High Madrasah Result 2016; West Bengal Board of Madrasah Education conducts various Secondary/Senior Secondary Level Madrasah Examination namely Alim, Fazil & High Madrasah. To Check the result of WBBME Exam Results 2016 please read on this post. This year WBBME conducted the Alim, Fazil, High Madrasah exams in the year 2016. The examinations mentioned above was started on 15th February 2016 and end up on 19th March, 2016. In 2016 total 65,397 candidates appeared in the said examinations. Total Male candidates of this year is 23,049. Total Female candidates of this year is 42,348. Availability of WBBME Alim, Fazil, HM Result ? WBBME Result 2016; Like previous years the WB Madrasah Board will declare Alim Exam Result 2016, Fazil Exam Result 2016, High Madrasah Exam Result 2016 on 13th May 2016 at 11 A.M through press conference. How to check WBBME Results 2016? You should click on the Result checking link and Your Roll No, date of birth will be required to check the result. From the following table please click the respective result checking link and provide the required information to get your result. WBBME Result 2016 published on 13/05/2016. 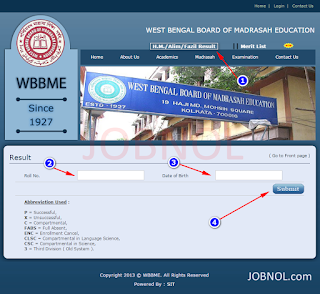 0 Comment to " WBBME Result of Alim, Fazil, High Madrasah Exams 2016 - wbbme.org "